The Pitta dosha is generally characterized as dynamic, ruddy, fiery-tempered, excessive, well-proportioned, sharp, bold, and hot. 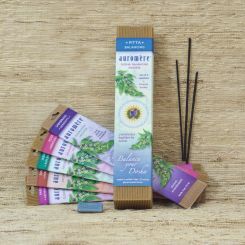 The Pitta balancing incense in this set are chosen for their calming, cooling effect on fiery Pitta natures, and their ability to reduce stress. They help to promote calm, restful states, aiding meditation and inner spiritual attunement. Ingredients: The incense included in this set are: Jasmine, Parijata, Rose, Sambrani, and Sandal. A decorative ceramic incense holder is included.